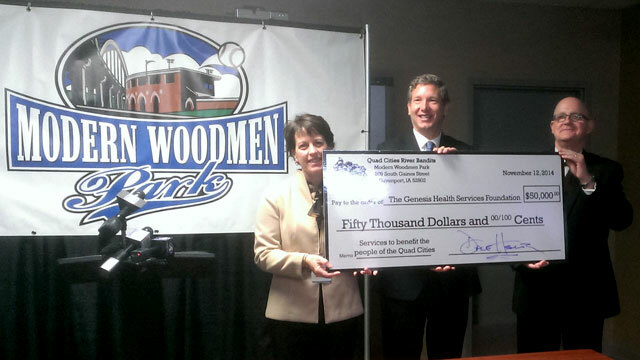 Fulfilling a pledge made for the inaugural season of the Ferris wheel and other amusements at Modern Woodmen Park, the Quad Cities River Bandits and Main Street Amusements on Wednesday presented a $50,000 donation to the Genesis Health Services Foundation. Dave Heller, owner of the River Bandits, presented the check to Ken Croken, Genesis Health System Vice President, Corporate Communications, Marketing and Advocacy, during a press conference Wednesday at Modern Woodmen Park. With a portion from each of 68,000 rides of the new amusements this season at Modern Woodmen Park - including the 105-foot Ferris wheel, the expanded 300-foot zip line, Space Camp gyroscope and the Mediacom Drop'N Twist - the donation will benefit Genesis Health Services Foundation health initiatives for children, including the Flu-Free Quad Cities campaign, Camp Genesis for kids who have someone close to them with cancer and Genesis Neonatal Intensive Care services to help struggling newborn babies. "The River Bandits belong to the people of the Quad Cities, and a big part of our mission is to make a positive and lasting impact across this great community," said River Bandits owner Dave Heller. "When both of my sons were born, they had to spend time in the neo-natal intensive care unit. Fortunately, we were able to afford such care. My hope is that, with this donation, needy families throughout our region will be able to come to Genesis and get the care they need when they need it. We are so grateful for all of the support we receive every day from Quad Cities families and we are delighted to be able to give back in a big way to help others in our community." "By their conduct here, the Quad Cities River Bandits and their owner, Mr. Dave Heller, have helped define corporate social responsibility for our community," said Ken Croken, vice president of corporate communications, Genesis Health System. On May 24, with an Inaugural Ferris Wheel Ride event and fundraiser, the Quad Cities River Bandits became the first team in Minor League Baseball to open a Ferris wheel inside its ballpark. Towering 105 feet above the playing field, the Ferris wheel was part of the debut for a full lineup of amusements that opened every weekend, including non-game days, for the Quad Cities community to enjoy through November 1. The Ferris wheel was named Monday as the Best Ballpark Improvement in all of baseball for the 2014 season by Ballpark Digest. It followed a year in which Modern Woodmen Park drew its largest average attendance - 3,885 per game - in the history of the 83-year-old ballpark. "The success and recognition the amusements have brought to this community has been exciting, but it is most gratifying when our success makes such a positive difference in the lives of Quad Cities families in need," said River Bandits General Manager Andrew Chesser. "This season's donation to the Genesis Health Services Foundation is another example of the strong partnerships we are blessed to have in the Quad Cities community." ABOUT THE BANDITS: The River Bandits ownership in 2014 made one of the biggest improvements to Modern Woodmen Park since the ballpark was first built back in 1931! A new Ferris wheel, standing 105 feet over the playing field, opened May 24, Space Camp opened June 20; the new Drop'N Twist debuted in July; and the newly expanded 300-foot long zip line also reopened.